The design process is set out in the Design and Construction Flowchart in 4.11 below. In addition, it is worth considering the six tips below in terms of good practice. 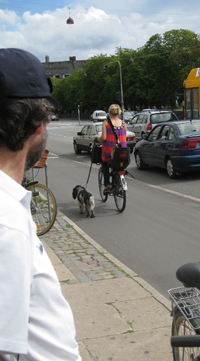 It is difficult to design for cycling without an experience of the mode. This website will include (in the future) some video footage taken of cycling, both from the cyclist’s perspective and from the point of view of other road users. However, this should not be considered a replacement for actual personal experience of cycling in urban areas. It is strongly recommended that designers cycle (and walk) along the routes that are to be designed / upgraded, and observe the conflicts and deficiencies at first hand. 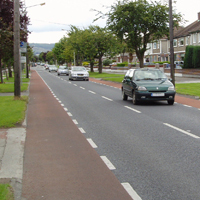 The Principles of Sustainable Safety remain central to all road and street design. At their core, they provide an excellent platform for conducting a “sense check” on designs of any type, but of cycling in particular. Is the design fit for purpose, i.e. does it work for the bicycle; does it deliver the target QOS? Is it legible, i.e. is the position and behaviour of all modes clear, logical and understood? Are all conflicts obvious, and is the resolution of those conflicts understood by all? Is it as homogenous as possible? Does the design place like-with-like, or are there significant differences in mass, speed and direction between the bike and other traffic? Is it forgiving? What are the main risks and what does the design do to lessen the severity of the outcome of those risks? How self-aware are the users? Is the design only for certain categories of road user / cyclist? How are the others to manage to get through the design? An efficient design is one that achieves its objectives within the constraints imposed from the start. It is therefore essential that the brief for the design is clear regarding constraints and objectives. Prior statutory planning context – SDZ or LAP specificity, conditions attaching to developments etc. Performance Based Objectives presume that there are fewer constraints, and that a suite of design options is possible, within which there are optimal designs. Method Based Objectives are usually appropriate to schemes where the network planning is complete, where the constraints are fully understood and quite limiting in their nature, and where the design scope for alternatives is therefore curtailed. Design Objectives and constraints need to be as clear as possible from the start. Otherwise, the degree to which the design contract has been satisfied will not be understood. Performance and Method Objectives should not be mixed. For instance, the planned QOS must be clearly stated and achieved in the Performance design, whereas the Method approach will have already satisfied the client as to delivering the required QOS. 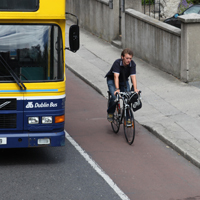 Recent Irish experience points to the provision of dedicated cycling facilities “where there was space” (e.g. 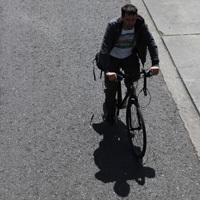 hard shoulders) at the farther extents of a route, with a cessation of provision for the bike (either in reductions in traffic intensity or through provision of space) approaching key destinations. It is essential that the bicycle mode be planned in conjunction with the other traffic modes in an overall traffic management plan. 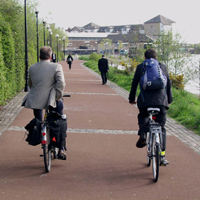 Otherwise, the cycle network will be disjointed and located where there is space, not necessarily where it is needed or can contribute to a significant mode shift. 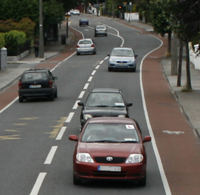 At a detailed design level, the bicycle needs to be integrated into the overall traffic management for a route. In other words, the bicycle should influence and have a bearing on current traffic management practice. If it does not relate to car parking, turning, signalling, etc…, there is a strong risk that the cycle design is isolated, may not deal properly with conflicts, and will not be successful. It is essential that cycle design not only meets the 5 Needs of the Cyclists, but also actively confers an advantage on the bicycle mode, in the context of the reality of private car ownership and usage. Journey time: Signal-free routes, priority at junctions, etc. A cycle route with a high QOS (e.g. B or above) will inherently confer these advantages. It is unlikely that a significant increase in cycling will be achieved, if the Quality of Service offered to the bicycle is low. 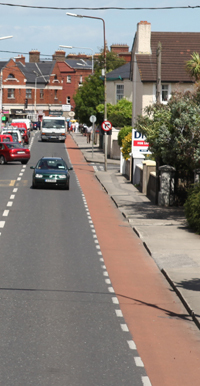 Irish roads and streets tend not be uniform in terms of width, appearance, traffic layout etc. 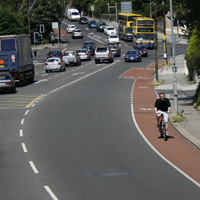 Therefore it would be exceptional that the cycle facility would remain constant along the entire length of a road. provides the target QOS for cyclists consistently along the route.